A deep-red photosensitive pigment contained in the rods of the retina of marine fishes and most higher vertebrates. Also known as retinal pigment; visual purple. (also visual purple), the main visual pigment contained in the retinal rods of vertebrates (with the exception of certain fishes and amphibians during their early stages of development) and invertebrates. Rhodopsin is a complex protein (chromoprotein) made up of 11-cis-retinal (chromophore), a glycoprotein, that is, a protein bonded to sugars, and lipids (the opsin part). The molecular weight of rhodopsin is approximately 40,000 in vertebrates and 70,000 in cephalopods. Rhodopsin forms an integral and highly organized part of the ultra-structure of rods. The isomerization leads to a gradual decomposition (photolysis) of the rhodopsin molecule, a change in the ionic transfer in the photoreceptor, and the initiation of an electric signal, which is transmitted to the nerve elements of the retina. 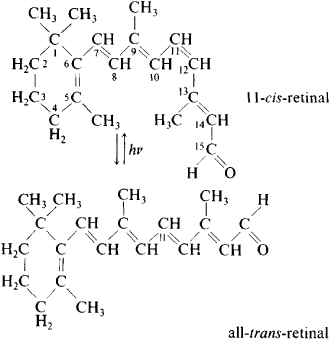 Rhodopsin is regenerated either through the synthesis from 11-cis-retinal and the opsin liberated after photolysis or through the absorption of a second quantum of light energy by one of the intermediate products of photolysis. Regeneration can also occur during the synthesis of new retinal rod distal segments; this is the principal means of regeneration where rods are concerned (Figure 1). It has been found that the cell membranes of certain halophilic bacteria contain a pigment that is also composed of retinal, a glycoprotein, and lipids. This bacterial rhodopsin, whose structure is yet to be conclusively established, appears to participate in photosynthesis together with other bacterial pigments. Boroviagin, V. L., M. A. Ostrovskii, and I. B. Fedorovich. “Fotoretseptornaia membrana i nativnyi rodopsin.” Biofizika, 1971, vol. 16, no. 2. Etingof, R. N., and I. A. Ostapenko. “Rodopsin: struktura i prevrashcheniia.” Uspekhi sovremennoi biologii, 1971, vol. 72, no. 2. The understanding of WFC process in rhodopsin necessitates a general understanding of the retinal bio-complex thus described which is given below as an overview. Ecological and lineage specific factors drive the molecular evolution of rhodopsin in cichlid fishes. Rhodopsin is the photo-pigment that is abundantly found in retina and plays an important role in the visual cycle . The findings support the idea mutations causing rhodopsin to aggregate can destabilise the outer segment, eventually causing blindness. Preliminary data suggest that the peak of spectral sensitivity for both B- and D-cells falls in the range of 450-500 nm, which coincides with maximal sensitivity range for the rhodopsin family of photopigments. We now know that the three-dimensional conformation of proteins is crucial to their function and that activation (as mentioned previously) commonly involves a conformational ("allosteric") change, whether for example in myofibrils during muscle contraction, activation of membrane-bound adenylate cyclase or of retinal rhodopsin. To explore the specific effects of bright light exposure on retinal function in Pacific halibut, the vitamin Al rhodopsin absorbance templates developed by Stavenga et al. For instance, light-activated excitation of rhodopsin (bacteriorhodopsin) molecules, involved in the hyperpolarization process of the cell membrane, can either generate nerve impulses, ATP synthesis, or regulate embryogenesis [1-5]. Balanced rhodopsin levels are crucial to facilitate better vision in dim light. About half of the material in the outer segment consists of rhodopsin, the pigment used in detecting light. Extracellular RNA has been detected in the plasma and serum of patients with various forms of cancer (4-6), DNA and mRNA of fetal origin have been discovered in the plasma of pregnant women (7-9), and significantly increased concentrations of rhodopsin mRNA have been found in the peripheral blood of individuals with diabetes (10). Amino acid sequence coded for displayed high sequence similarity with Rhodopsin and was thus thought to bear photosensitive properties (24).